WireLace®, sold per one (flattened) yard, is a mesh ribbon woven of very fine wires of brass, copper and/or aluminum and bonded with color coating: open and stretch/shape as desired — use for jewelry, crafts, textiles and embellishments; bake directly into polymer clay, etc. Nickel-free, waterproof (can be used for items that may get wet or need to be gently hand washed) and heat-resistant under 275 degrees. 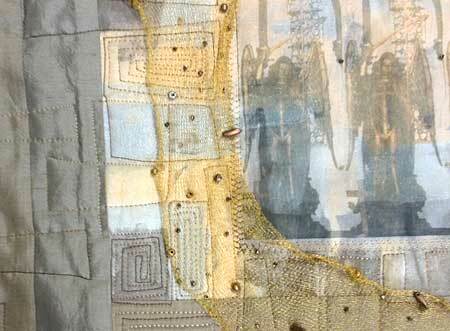 Example pictured here is an excerpt of an art quilt by Artistic Artifacts owner Judy Gula using beaded and stitched WireLace.